Where have I been for the last couple of years? Have I been living under a rock? Why didn’t I know what Sharrows were until just yesterday? I’ve seen the chevron looking markings on the road in one section of my commute but until yesterday I had no idea what they meant. I’m a dunce! In my defense, the markings I have seen in Oceanside haven’t been there for two years but at least 6 months! 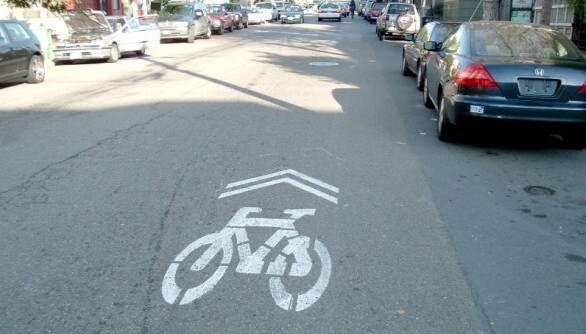 So what are Sharrows? Below is an image of one. What are they used for? Here are some examples. So this morning “On my Commute” I decided to pay more attention to them as to where exactly they were located, and record a little video. Interesting commute– It appears I’m not alone at not knowing what the chevron markings mean. Cars honked and made nasty gestures as they passed me. All the while I was just below the posted speed limit of 25mph going about 23mph. Two miles/hr would be imperceptible to a motorist driving behind me at above the speed limit. Look at this short video where I am traveling 25 mph in a 25 mph zone and the car behind me is going 34 mph (notice the flashing speed limit sign). He then passes me and makes angry gestures pointing to the yeild to him and to get over to the right of the lane. Oh by the way, I was loving my Fixed Gear bike this morning until this butthead. (cue Mission Impossible theme) Your mission, shall you choose to accept it is to tell just one motorist (coworker, friend, relative) what Sharrow markings mean. Do it as an “Oh by the way, did you know…?” Don’t bother doing it on the road — you’ll never get through to them! I have completed my Mission — you do the same. The video below features Tony Cruz, professional bike racer, talking about Sharrows in Long Beach! This entry was posted in Fixed Gear, On My Commute, Raising Awareness by REV Cycling Directeur Sportif. Bookmark the permalink.